An artist working in collage can make one of two major statements: by selecting and cutting material from piles of old magazines, the collagist either despairingly critiques the ever-flowing fountain of consumer information, or else she is a cosmopolite, joining disparate faces and places into a communal frame. Candace Hunter is this second type of collagist. She is a practitioner of inclusion and willingly inherits the wealth, and burdens, of history. When Hunter was a child, she visited the Art Institute so often with her mother and siblings that she believed the museum was built for her. She saw every exhibition, and was privy to behind the scenes tours. Later in life it came as a surprise to her that not everyone in her community felt this way about the museum. Although it is open to the public, many African-Americans, she says, do not feel welcomed by high culture. They restrict their own access. “Like the air we breathe,” says Hunter, “art belongs to all.” For seven years Hunter covered the African-American art scene in Chicago for N’Digo, a weekly magazine. Her goal was twofold: increase exposure of African-American artists in the local media, and invite newcomers to the art world. At the time, African-American artists weren’t getting many shows in the traditional museum and gallery venues, and Hunter believes she was successful at highlighting alternative exhibition streams, such as dining rooms, studios and street corners, and new audiences were finding their way to enjoying art. In her studio in Kenwood, a painting in progress contains a freely lifted colorful Jasper Johns painting, here remade into dresses for dancers. “When I steal, I steal good!” she jokes. But mostly she takes from an older generation of African-American artists, no more stealing than inheriting her influences. 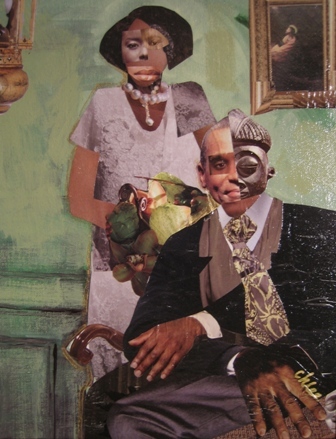 Many collages in her ongoing “Familial Impressions” series borrow stylistically from the great Romare Bearden, and compositionally from James Van Der Zee, a photographer from the Harlem Renaissance who documented men on stoops and in front of barbershops, and women posing in silk and furs. The Van Der Zee compositions are the bones upon which Hunter hangs her family’s clothes. The “Familial Impressions” collages lift scenes, real and imagined, from Hunter’s own family history. She unearths stories and moments buried in her memory as told by her grandfather. She re-envisions sepia-toned family photographs with masks, lips and hands from manifold sources. Borrowed faces animate those of deceased relatives, and the family line extends. These family portraits hang on Hunter’s wall like the framed family snapshots in anyone’s mother’s home. Their subjects smile expectantly toward an unknown future. Although she’s been making art for a long time, Hunter became a full-time professional artist just four years ago. She was working at Gallery 37, a city-operated cultural endeavor, as a career counselor. Every day she encouraged artists to live their dream, and one day she followed her own advice. Now she has gallery representation at Nicole Gallery in River North, but still finds time to engage her community. In a recently completed project for Archi-Treasures, a program that brings public art into housing developments, Hunter worked with young adults to build an interactive playground mosaic at 43rd Street and Michigan Avenue. Hunter says there are things in the world that are bigger than the ground we stand on. Being an artist, she says, allows her to funnel those elements into doing good works. “I just try to listen,” she says with a gentle, knowing smile.